Any information provided is provided as a courtesy. We are unable to provide any warranty regarding the accuracy or completeness of the content, the reliability, quality or effectiveness of any events or products provided and are not expressing any endorsement of the views, information or products provided or held by the events listed. Some of the listed events may be on hold. Most events have contact info for updates on the events. 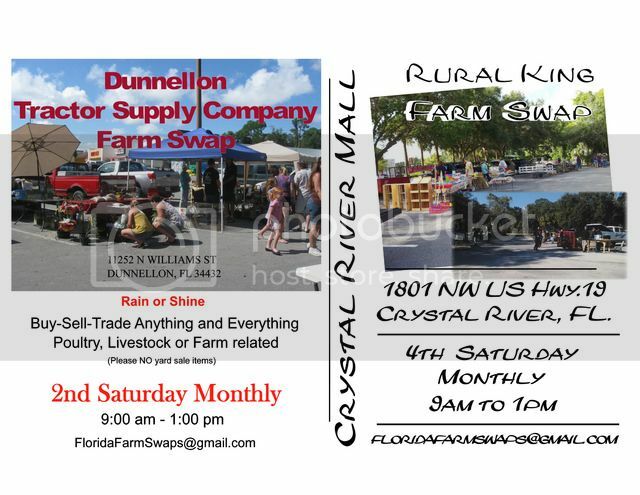 The Crystal River Mall and Rural King Farm Swap, (on the ***4th Saturday Monthly***) 1801 NW US Hwy. 19 Crystal River, FL 34428 located in the parking lot of the Crystal River Mall at the Rural King, and The Dunnellon Tractor Supply Company Farm Swap, (on the ***2nd Saturday Monthly***), 11252 N Williams St, Dunnellon, FL 34432. You won't want to miss these events. Come join us and meet the locals. Buy/Sell/Trade anything and everything to do with poultry and livestock. Maybe you have chicks, chickens, turkeys, geese, ducks, guineas, quail, rabbits, goats, horses, pigs, a cow or two, eating eggs or hatching eggs to sell. How about some pieces of old farm equipment, a small tractor, harrow or used tack. Maybe you have fresh fruits, vegetables, plants and trees. What are you going to do? Bring it on down to the Crystal River Mall and Rural King Farm Swap and the Dunnellon Tractor Supply Company Farm Swap. Great exposure, lots of parking, lots of potential buyers. These are Farm Swaps only so we ask that there are no flea market or garage sale items. You can also bring farm related items like goat soaps and lotions. Tell your neighbors, your friends, heck we don't care if you tell your enemies. Meet us the Farm Swaps for a day of buying, selling or swapping your farm related wares. No fees. For the month of August and possibly September we will be holding our Dunnellon Tractor Supply Farm Swap at Rural King in the Crystal River Florida Mall. There is construction going on around Tractor Supply and Rural King has offered to let us use their parking lot for both the ***2nd*** and ***4th*** Saturdays.